Suspects including engineers and two government employees will face trial in Saudi Arabia over the deaths of 107 people when a crane toppled over at Mecca’s Grand Mosque last year, a local newspaper that reflects government thinking reported on Tuesday. The Arabic-language al-Riyadh newspaper quoted a source as saying that investigators and the prosecution had completed an eight-month investigation into the case that was conducted in secrecy and which involved questioning a number of suspects. “The court is in the process of deciding the (date of the)first hearing in coming days after the judge studies the case,” al-Riyadh said. It said those charged included engineers and two officials working for two government bodies in Mecca, but did not specify what the charges were or how many people would face trial. According the Reuters, the crane disaster was embarrassing for the Saudi royal family, which defines itself as guardian of Islam’s holiest places and has embarked on a series of expansion projects at pilgrimage sites in Mecca. It quickly suspended construction giant Saudi Binladin Group, the main contractor on the mosque expansion, from seeking new contracts and placed travel bans on its senior executives, penalties that were later lifted. 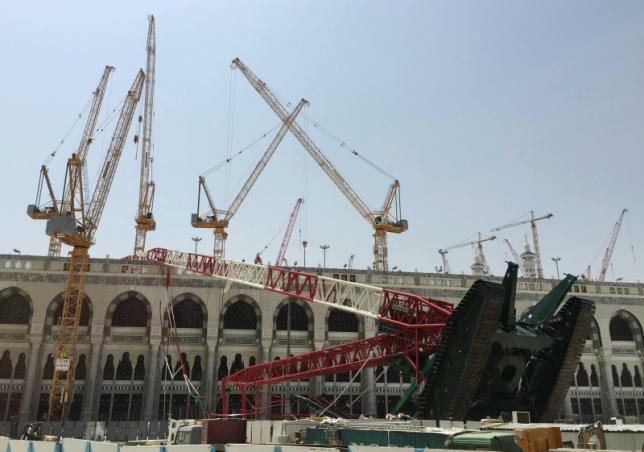 The crane fell over at Mecca’s Grand Mosque in September 2015, less than two weeks before Islam’s annual haj pilgrimage. Saudi Binladin Group, one of the largest contracting companies in the kingdom, which was founded more than 80 years ago, had been carrying out expansion work at the mosque. The company has long been regarded in the conservative Islamic kingdom as the government’s favorite contractor for important or sensitive work, including defense and security projects and jobs in Mecca’s holy places.